Set in 16th and early 17th century rule of the Mughal Empire in India, Mehrunnisa is born to a Persian courtier to the Mughal emperor, Akbar. The family came from humble beginnings but Akbar earned his way into the life of courtier. When Mehrunnisa was 8 years old, she got a glimpse of Salim, the crown prince of the royal family. It is then that she makes it her life's goal to marry him. She was devastated when her father told her that that she was to marry a not so royal man but did as she was bid, as women had no choice back then. Her marriage was not a happy one. She had several miscarriages until she finally has a daughter. Her husband seemed to think she miscarried and didn't give him a son on purpose. Eventually Mehrunnisa has another chance meeting with Salim, who is just as infatuated with her. He has many wives but his chief wife, Jagat Gosini is the main contender to stand in the way of Mehrunnisa finally getting her dream. This is a deeply moving story of love and the history of the Mughal Empire. I listened to the audio version and the narrator Sneha Mathan brought the characters to life. I felt like I was living life back in India with Mehrunnisa. 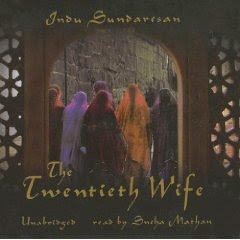 Indu Sundaresan has a way of painting the story with words. I can hardly wait to read the sequel, The Feast of Roses. I am sure I would love reading this book. I read all over the board when it comes to historical fiction. Thanks for the review. Pricilla, it is a wonderful historical. I hope you read it.